Buildings; what is it about them that keeps me enthralled? Is it their form, materials that they are constructed from? Or maybe it's mostly due to the feelings that they arouse in me. There are different kinds of the feelings; those that I have now when I encounter a building as an adult and a feeling that enhances a previous feeling. I often have a deja vu kind of enhanced experience of a building because actually it is reawakening memories from my childhood. Re-experiencing long forgotten experiences by delving deep into my memory is what I do when I am in that half asleep half awake state. That state when almost all of my real creative work is done. This is when you are neither here (2011) nor at some point in your past.... nor possibly (if you believe that it is possible) at some future point in your life that you do not yet recognise. Earlier this year I bought a very much talked about book, CCCP (Cosmic Communist Constructions Photographed) by Frederic Chaubin When I ordered it I had no idea how talked about it was to become, I had simply pre-ordered it online and then forgotten about it until it arrived two months later. Little was I to know that it would inspire me on so many levels - the introductory essay alone led me to rewrite my artists statement! It is the most wonderful book possible in my opinion. The only drawback is that it is huge and very heavy so definitely not one that you can pop in your bag for a train journey! Not being a writer I am fining it hard to describe just how much bliss I have experienced while poring over the pages. Obviously I have a strong interest in the Brutalist and Futuristic buildings that Chaubin has tracked down and photographed but there is also so much more to these incredible and fantastic structures. I think that Chaubin has captured these places in such a mesmerising way that not only am I entralled by the buildings but by the sensual photographs too (so many of these I just drool over ... again ... and again). These photographs are keys ...they are opening the doors to so many memories in my mind. I don’t need hypnotherapy to re-visit some of the deepest and most elusive fragments of my childhood experiences of buildings and interiors, because I have begun to just open CCCP, turn the pages ... calmly, ... rhythmically, ... carefully, ... with my eyes devouring the images, ... and before I know it I have been whizzed back along some neural pathway to a snapshot in my mind - to a time and place that I didn’t even realise was so important. Chaubin’s photograph of Zavarnots Airport Control Tower is one of my favourites, although there are so many that I have now given up marking the pages (see the plethora of sticky page markers in the photo above)! 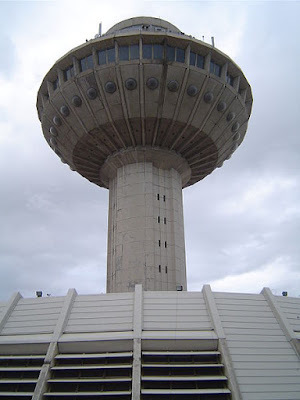 Zavarnots Airport Control Tower is on page 118 of CCCP but in order to avoid copyright infringement here is an alternative image of it from Wikapedia. See photo below by Marshal Bagramyan. I know that I am instantly drawn to it first because of it’s form. I already know that several of my sculptures have similar segments, and that ring of circles on the underside of the tower could so easily be buttons in my mind. 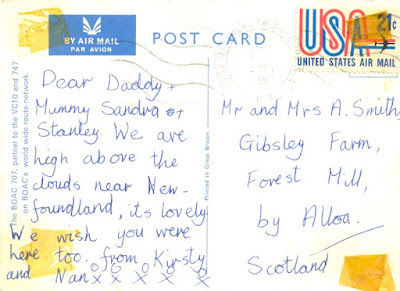 When I was 8 I accompanied my Nan (grandmother) on a trip to visit my cousins in Detroit, USA. I wrote this postcard while on the flight. After our long, but for me exceedingly exciting flight we landed at Toronto. Being in Toronto we had to visit the Niagara Falls. 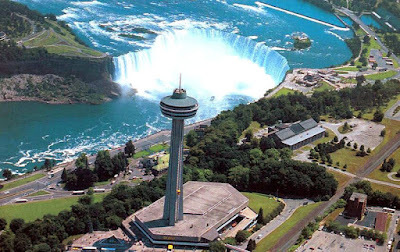 Just opposite the Niagra Falls there’s The Skylon Tower. Zoom in on this picture to see the tiny yellow lift that travels up on the outside of the tower. My nan was an amazingly adventurous and lovely lady. She certainly knew how to make things special for a little girl. I can’t remember even imagining the possibility of traveling up this scarily tall building but before I knew it I was in that little yellow bug of a lift and we were whizzing up the outside of the tower. You have to remember that this was back in 1972 and I lived a quiet country life. This was exciting... oh yes! But I'm sure I would have also felt just a bit nervous being in a lift on the outside of a building! So The Skylon tower was built in Canada in 1964... Meanwhile back in the UK another of my now favourite landmarks was built as part of the M6 motorway services at Forton. I’ve driven past so many times over the past 27 years but only just took this photo earlier this year. For lots more information and images of the building of this landmark tower visit its own dedicated website. 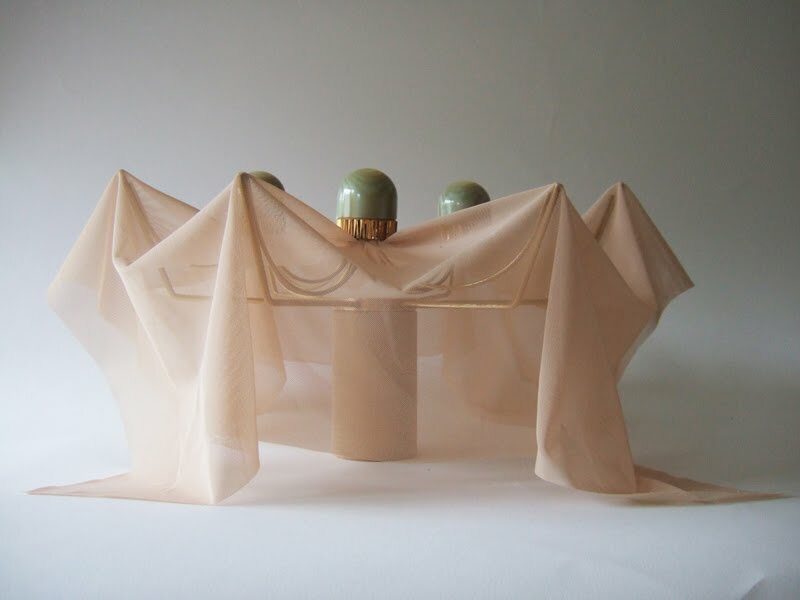 'Strange One' is my latest sculpture (being). Photographing her was interesting. I like when you experience a sculpture over and over. I like to encounter the work and be surprised. She has been an awkward little thing. So elusive to reveal herself. At the centre of 'Strange One' is a set of avocado green acrylic bathroom tap heads which had sat on a shelf in my studio for months. I had looked at them, held them in my hands, and felt quite intrigued by them. I knew I wanted to use them to make a Frillip Moolog being but if anyone had asked me what I was going to call her I would have said 'Margot'. 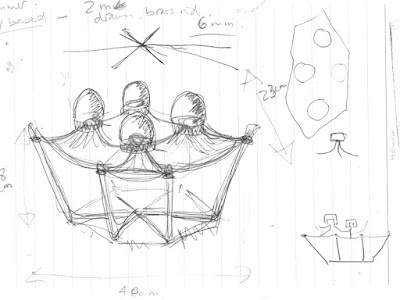 However she changed so much in the making from my first sketch to having access to the right equipment to make the brass structure. 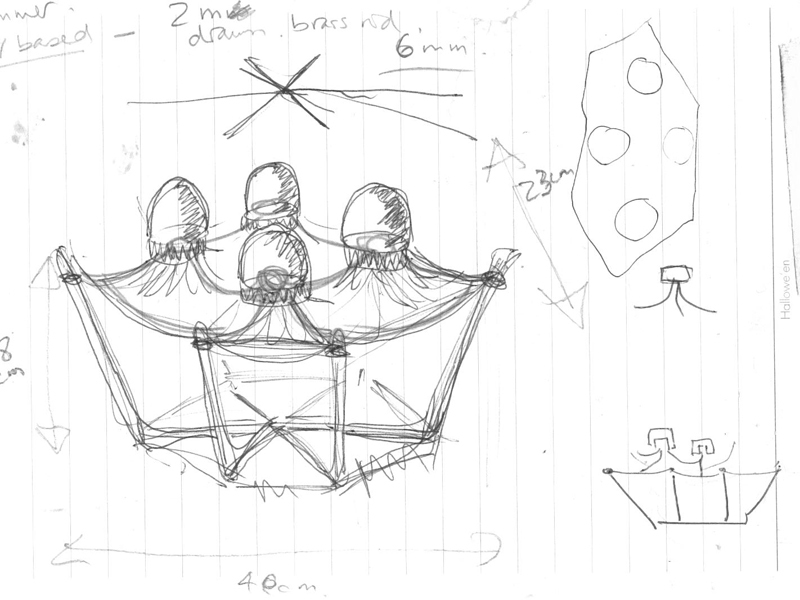 I was definitely thinking of trapezes and circuses when I did this rough sketch (see below). Making her was a slow process and she languished on a shelf again for more months while I tried many permutations of fabrics. Right at the very end I realised that 'Margot' had grown into a much more interesting being. She became 'Strange One'. She is fairly small but seems to have a monumental presence in her photographs. I am enjoying her strangeness and for me this image (below) is best. I love the viewpoint; it reminds me of being a child and looking up... being open minded and full of wonder. Back in December 2009 we saw the Moscow State Circus perform when they visited Birmingham, UK. 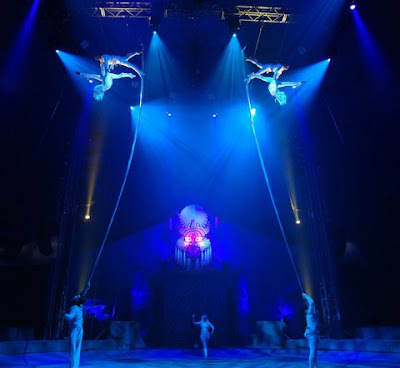 Compare the photo of 'Strange One' (above) and this photo (below) of Moscow State Circus trapeze artists suspended on cables within the dramatically lit and draped circus ring. 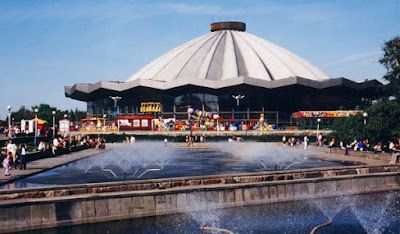 Of course is it any surprise that the permanent home of Moscow State Circus is also included in my all time favourite book CCCP? This photo taken from Wayfaring website. To see Frederic Chaubin’s photo of the building see page 186 of CCCP. This is a book worth spending time with. The Forton Services Hexagonal tower has been a favourite landmark for years. From now on when I drive past it, I will think of Soviet Russia, Niagara Falls and Strange One. Another fascinating and thought-provoking blog, Kirsty. How interesting to find out about some of the influences for your work. I've never seen your art 'for real', only know some of it from images, and my impression of scale was way off, esp. with your newest gorgeous piece. Because I thought the objects were small (there's something intimate about them, as for example with the gorgeous Mi Wawa) I wouldn't have made connections to architecture all by myself. I understand that you see them as 'beings'. A lot of my pieces seem inhabited to me, probably because they make me feel something.